$product_name% is not sold in this country. Head lice are commonly found on the scalp. They feed off human blood but are not known to spread disease. Having head lice does cause intense itching, which can be very annoying in itself. Head lice are most common in (school-going) children due to the high risk of reinfestation. Although having head lice is a very frustrating problem, it can be treated effectively. For example, you can comb your hair with a lice comb or use a lice-killing product. Prioderm contains the active ingredient malathion which is an insecticide that kills parasites such as head lice and lice eggs (nits). Prioderm lotion should be applied to the scalp and rubbed into dry hair from the roots to the tips until all the hair is moistened. The best way to do this is to make a small parting and apply a few drops of the lotion along the hair, then spread this evenly along the length of the hair. Leave to work for 12 hours while the hair dries naturally. Then shampoo the hair in the normal way. Rinse the hair and comb it using a fine-toothed nit comb while the hair is still wet to remove the dead lice and eggs. Treat the hair once a week with Prioderm lotion. Do not use for more than three weeks. As Prioderm lotion adheres to the hair for several weeks, it reduces the chance of reinfestation. Prioderm shampoo should be applied to wet hair. A sufficient amount should be used to work up a rich lather and ensure that no part of the scalp is left uncovered. Pay special attention to the back of the neck and the area behind the ears. Leave the shampoo on for four to five minutes before rinsing thoroughly with water and then repeating the procedure. While the hair is still wet, comb the hair with a fine-toothed lice comb to remove the dead lice and eggs. This treatment can be repeated after a week if there are still lice and nits in the hair. Prioderm preventative spray should be applied to dry hair every morning to prevent head lice. Do not rinse out. The spray works for a minimum of seven hours. Prioderm preventative spray is a mild, colourless head lice repellent with a neutral scent. To make sure all lice and nits are eradicated, it is important to comb the hair with a lice comb (nit comb) for 14 days. Wash the hair with Prioderm shampoo. Then meticulously comb each strand of hair with the lice comb. After each pass through the hair, wipe the comb on a white paper towel to see if nits or lice come off. Rinse the hair and clean the lice comb when finished. Lice eggs or nits attach themselves firmly on the hair shaft and are often difficult to remove, even if the hair is treated with a head lice repellent. Priolox foam dissolves the hard nit glue that encircles the hair shaft. It also makes the hair easy to comb through with a nit comb. 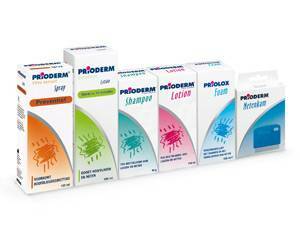 Priolox foam is suitable for use in children from the age of six years. Warning: Chlorine deactivates malathion, the active ingredient in Prioderm. Do not swim in a pool with chlorine water within a week of using Prioderm.